Michy Batshuayi heading back to Chelsea? 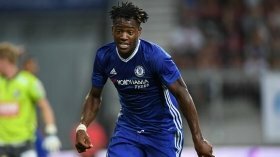 Spanish club Valencia could reportedly terminate the loan contract of Michy Batshuayi with the Chelsea striker struggling for form during the ongoing season. The 25-year-old joined Los Che on a season-long loan during the summer after being deemed surplus to requirements under Maurizio Sarri but he has since not found much success with just three goals in 20 appearances for the Spanish side. According to Marca, Los Che are keen on parting ways with the Belgian and they intend to send him back to his parent club when the transfer window reopens. Batshuayi has largely misfired during his time with the Mestalla outfit and he has not found the scoresheet since netting against Celta Vigo in September. Despite this, it appears that he could pursue another loan move on his Blues comeback with former Belgium assistant Thierry Henry keen on reuniting with the striker at Monaco for the second half of the season.